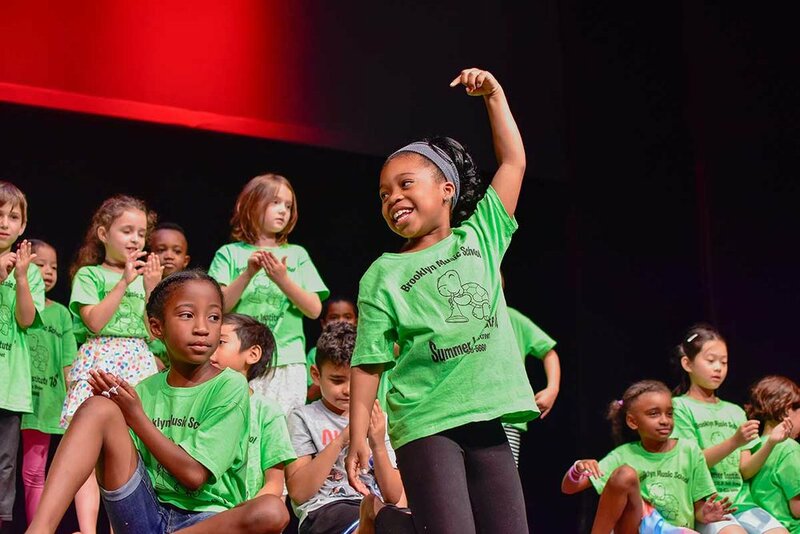 The BMS Summer Music & Dance Institute provides children ages 5 - 8 with a broad introduction to music, dance, and the performing arts at Brooklyn's best and most affordable summer programming. BMS's seven week program is packed with creativity, fun, and new friendships. This is the "best-kept-secret" for an affordable and enriching experience for Brooklyn kids, and is designed so that families can choose one week or all seven weeks, to accommodate other summer travel plans. Students get exposed to learning new instruments from BMS's world-class music faculty, learn new dance moves from our dance teachers, and put it all together in performances in the famous BMS theater. 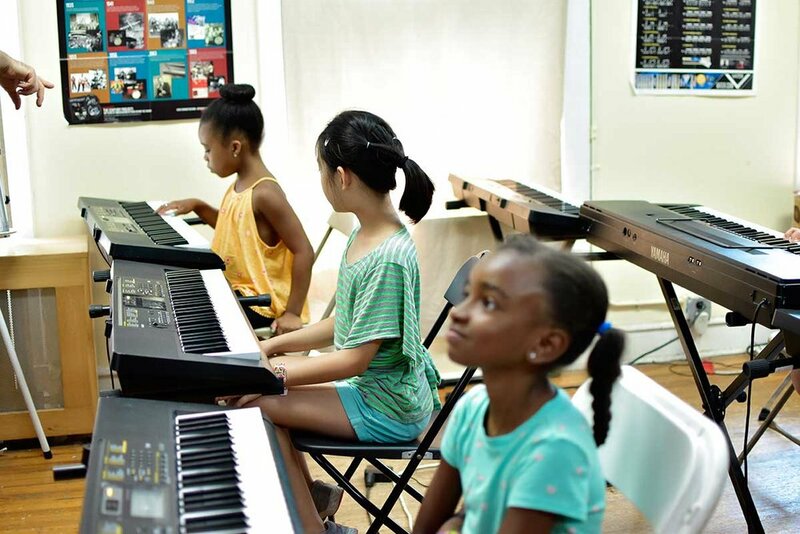 Depending on the week, the Summer Music and Dance Institute offers students classes in Musical Theater, African Drums, Contemporary Dance, Music FUNdamentals, Drum Rhythmology, Piano, Violin, Ukulele, Guitar, Hip Hop Dance, and more. 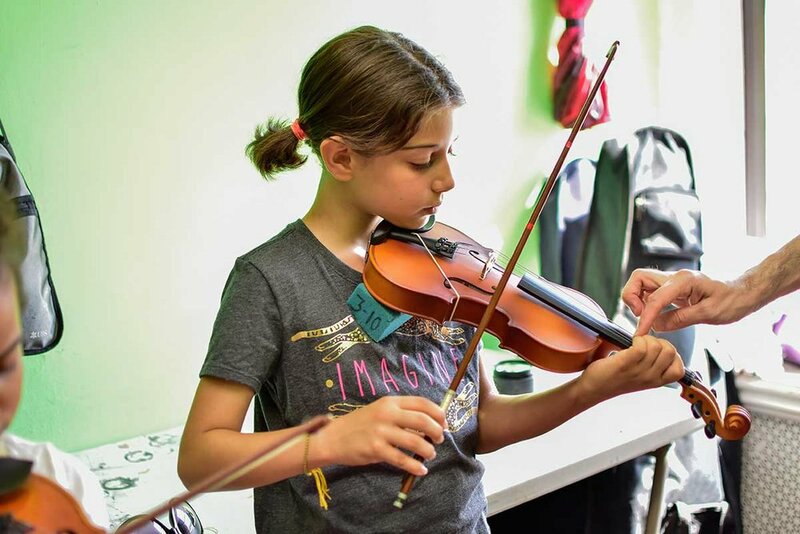 Musical instruction and performance is combined with frequent field trips, outdoor play, and performances for parents and friends. Previous field trip locations have included: The Brooklyn Museum, the Prospect Park Zoo, the New York Aquarium, American Museum of Natural History, The Brooklyn Children’s Museum, the Museum of the Moving Image, and more. In 2019 we have plans to go to the Intrepid Museum. The fee for each week is $400. Extended day is an additional $10/day. Early bird specials are available through March 1, 2019. In order to enroll, you must put down a 30% non-refundable deposit to hold your spot. The program needs to be paid up in full by June 15th. Payment plans and financial aid are available. Deposit and payment plans needs to be arranged by phone, or in-person. They cannot be set up or made online. Refunds for the Summer Program cannot be given after June 18th. Refunds prior to June 18th are subject to a 30% processing fee. How old does my child have to be to register for the Brooklyn Music School Summer Music & Dance Institute? 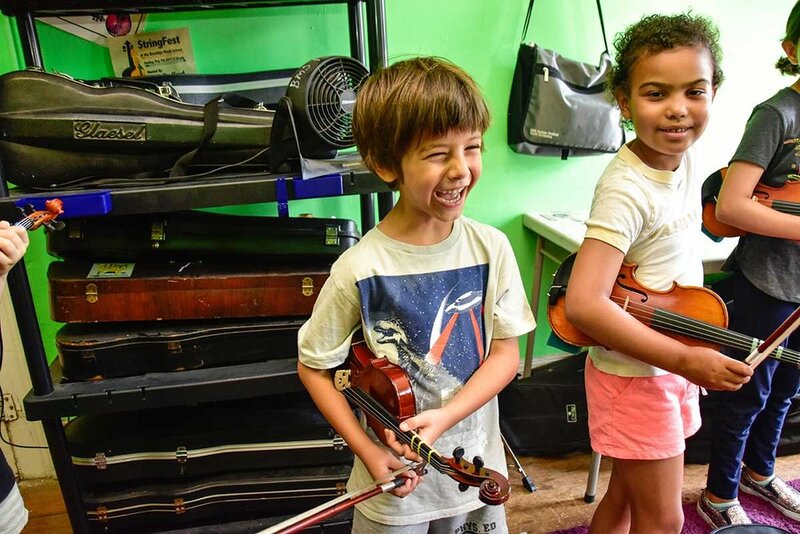 - Children ages 5 - 8 can register for the Brooklyn Music School’s Summer Music and Dance Institute. For children ages 9 - 12, we have our Summer Intensives. - Drop off is between 8:00am- 9:00am. Do I have to register for every week of the Summer Institute? - No. You do not have to register for every week. You may select the weeks you would like to register for. - Every group holds a maximum of 20 students. Each group has 2 counselors, 3 music mentors, and 1 instructor during instructional hours. Will my child be behind in class if he/she begins in the middle of summer? - No. Our curriculum is organized so that any students registered to begin in the middle of summer will have a smooth transition. Each week students learn new material to build upon anything taught in the previous weeks. All courses are introductory. How late can I register for extended day? - It is recommended to register for extended day before the start of your child’s first day. You may also register for extended day the day of. Just remember, the cost is $10/day for extended day. - Please refer to Summer Parent Handbook. Does my child have to wear his/her t-shirt every day? Can I request that my child be placed with his/her friend(s)? - Yes. You may request that your child be placed with his/her friend. - The request must be mutual, and e-mailed to Chris Colon at ccolon@brooklynmusicschool.org. Please note that some request may not be granted due to the group size limitations. 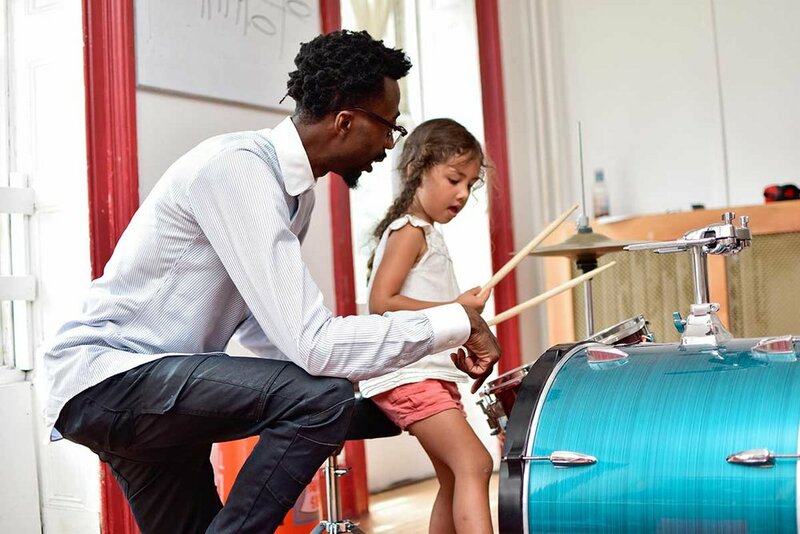 Does my child have to bring his/her own instruments? - Students are not required to bring their own instrument. We supply instruments for students to use while here. - Lunch will not be provided. Please pack a daily lunch and snack for your child. You may also request a Habana Outpost meal plan. If you would like to order Habana Outpost for your child, request forms must be submitted a week in advance. How will the students travel to trips? - Students will travel to and from trips by public transportation on the NYC Subway. Will there be air conditioning in the building? - Every classroom will be equipped with air conditioning.